The root of the word “orientation” comes from the idea of using the rising sun — the east — as a reference point to stay on course. We” orient,” then as the day passes into night, we become “dis-oriented,” until the sun reappears and we can “re-orient” ourselves. A sublime and simple process — that will preach, by the way (just don’t get too cute substituting Son for sun…). This comes to mind because I just unearthed a folder of congregational profiles that I was working on two summers ago, just before I was let go by the General Board of Discipleship. The study intended to determine where our United Methodist congregations are aligning their energy and resources. It wasn’t intended to judge or imply value, but to merely describe and better understand the orientation of our current reality. The survey involved selecting one preference from 60 forced choice pairs. For example, “If you could only do one of the following in each pair, which would you choose? — A fellowship supper or a Bible study. Attend worship or go on a mission trip. Sharing my faith with a non-Christian or visiting a church member. Working at a soup kitchen or my church rummage sale. Attend worship or a Bible study. Visit a sick church member or visit inmates in prison.” Then a weighted average of the overall scores were plotted on a chart indicating four orientations: inward focus on our church, inward focus on relationship with God, outward focus on our church, and outward focus on relationship with God. Inward focus on our church — this orientation places the highest value on the existing fellowship within the congregation. Member care, tending to the ongoing ministries, visitation, fellowship, familiar worship, familiar Sunday school and small groups, etc., characterize this orientation. Church is essentially the place we’ve always gone and love dearly, with little desire for change, but an enduring hope for new people (very similar in every way to the people already here) to keep things going. In less healthy situations, the church becomes very ingrown and inbred, doing little ministry for anyone outside the congregation, expecting the pastor to “only” care for the local church, and resistant to almost any and all outward focus or change to attract “different” audiences. Outward focus on our church — this orientation places the highest value on programmatic activities that attract new people to the church and that empower existing members of the church to serve in the community and world. These churches provide many services and programs to the community like day-care, 12 step programs, weight loss/exercise programs, crisis counseling, etc. Individuals and congregations with such an orientation are ready to join existing service projects as well as launch new ones. Mission trips, local missions, partnerships with community agencies and other churches, and mission education are central to these churches. In less healthy situations, a handful of people can “do” missions and outreach for everyone, with the majority of members/participants uninvolved in meaningful ways. Sometimes churches with this orientation get so busy “doing,” that they neglect the spiritual formation and fellowship aspects of the church. Inward focus on relationship with God — this orientation manifests itself in individual commitment to spiritual formation and faith development. Small groups, worship services, Bible study, etc., are driving and defining programs in these congregations. The appeal in these congregations is more on the individual and his or her relationship with God rather than on the importance of connecting in community. Learning, forming, growing, transformation, journey — these are common terms to describe the focus of this orientation. In less healthy situations, you find people endlessly studying and talking about faith rather than actively engaging in faith. There is always another book to read, more time to discuss and explore — and learning and formation become an end in themselves instead of a means to the end of fully engaged discipleship. Outward focus on relationship with God — this orientation highly values evangelism and faith sharing, going out into the community and world to share the good news. Church is the place where we are equipped to be witnesses and disciples, but the real work of the church is in the world, and the purpose of the church isn’t to care for members, but to reach those who are not yet Christian. In less healthy situations, an anti-institutional mindset kicks in where the needs of the local church are irrelevant, and many individuals with this orientation shake the dust off their boots and leave organized religion altogether. In summary, the four orientations could be labeled: Nurture/Fellowship, Outreach/Service, Formation/Christian Education, and Witness/Evangelism. In reality, every congregation is a blend, or spectrum, of all four orientations, but as with any collective, one orientation predominates — and in modern-day, mainline United Methodism, I’ll give you one (1) guess which one it is. Yep, you guessed it. Nurture/Fellowship kicks the holy heinies of the other three. 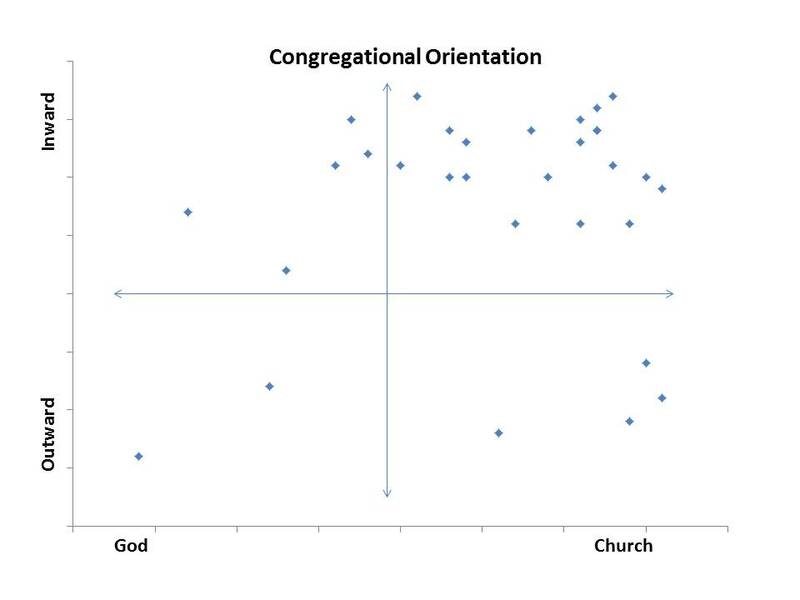 Here is an example of the scatter diagram of one church. It is exemplary of all 721 congregations that participated in the study. Yes, 100% of the churches — big, small, old, new, middle-class, lower-class, upper-class, predominantly white, African-American, hispanic/Latino, Korean, multicultural — all of them showed similar profiles. This congregation only had thirty people fill out the survey, but regardless of the sample being 12 or 200, the scatter is almost identical — Nurture/Fellowship accounting for about 63% of active members; Formation/Education a distant second with approximately 17%; Outreach/Service accounting for about 13%; and poor little Witness/Evangelism around 7%. For me, this merely presents data and information to confirm what most of us already know: the majority of people connected with our congregations are there seeking to be served and taken care of. They are consumers of the church’s product (which they define in terms of personal need). Generally, when congregational leaders are segregated in the summary reports, there is a much greater balance of the four orientations — which explains why leadership is often so challenging. The vision of the leadership is out of sync with the primary motivations of the majority of participants. Some look at such information as terribly depressing — that we are trying to drag a complacent and consumeristic church culture kicking and screaming into Christian outreach, spiritual formation, and service. However, it also offers a measure of grace — helping us to envision ways to meet people where they are to perhaps bring greater balance to the overall orientation. It becomes the work of leadership to gracefully “disorient” then “reorient” people in ways that are nominally threatening and unwelcome. For example, many people will join together to serve others as long as they can do it together in fellowship with their friends. Spiritual formation and Bible study often have greater appeal when grounded in fellowship and relationship building. We don’t have to change people completely, just disorient them a bit — stir the pot, and use what is comfortable and familiar as the foundation for doing some new and different things. I’m trying hard to keep this sort of orientation as my mindset as a leader. I pastor a small rural church. It is amazingly healthy in the area of fellowship, Bible study (including depth of knowledge) and willingness to do whatever is necessary…for the maintaining of the church (from volunteering to contributing to any and all needs). Of course, they probably score close to a 0 on “outward focus” categories. My focus will be to ask “What is God’s will for you…what is God’s will for us?” To answer that, we’re going back to a lot of the fundamentals they’re familiar with–Bible study, prayer, and so on. So many of them have agreed to begin a study that explores knowing God’s will. The study orients them both inwardly and outwardly. My hope is that strategies like this will slowly bring about a new orientation. My fear is that it will be embraced as “nice” and then everyone will go back to what they were doing before. I wonder if the way the questions were formed shape our interpretation. It was whether we could do one of these things, which would you do. This may be telling us where the comfort level is more than indicating an outright aversion to the non-inward/church activities. Maybe it indicates an opportunity for forming and building comfort and desire. It’s a pretty standard form and highly valid to push through to actual preferences. I’m very comfortable with the survey — 60 factors is on the high side and they plow through a ton of bias. What I think they reveal is the kind of church most mainline Americans prefer. We have tended to evaluate church leadership in terms of how satisfied- not how disoriented– church members feel by the pastor. 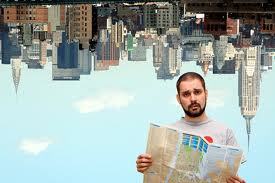 But leadership means shepherding people to a place where they are not yet, and that means change and disorientation. We have to create trust and safety– but leadership inherently means discomfort. The question is how much disorientation people will tolerate. We can’t force people to change. My experience is that most church folks will resist changing very much. So how do we lead? I bet the crucial element is not how balanced the church is in its discipleship, but how balanced we pastors are. As leaders we work with the people in the church, accepting where they are, and disorienting them and nudging them forward in the small ways we can– and meanwhile we do our best to balance the four emphases in our own ministries. And in our own outward focus on God, maybe we are likely to encounter people– outside the church– who are ready to engage in more balanced discipleship. That’s what I’ll be working on this year. What do you all think? You who are ahead of me on this journey–what’s your experience? I have these exact same impulses so this is not a criticism. I wonder where the line is between seeing it as “our job” to nudge, disorient, and push people and recognizing that God’s grace is the agent of change. I suppose we pastors are ourselves bearers of that grace so you can’t make that distinction, but I’m always reminded of something Eugene Peterson wrote about pastors being closet Pelagians when it comes to changing people. The line is fine. I always appreciate a distinction I came across year’s ago (and don’t remember the source) between motivation and manipulation — motivation being internal, what moves from the inside, while manipulation is external, moving someone for them. We motivate people to do what they want to; we manipulate people to do what we want them to. I fall to the side of motivation — trying to unlock a desire for a holistic approach to faith (realizing that for many, this is my agenda, not theirs). My approach is to seek those who want more, connect with that deeper desire, and not waste a whole lot of time with those who don’t want anything other than what they already have. Certainly I continue to offer the invitation, but I don’t make a whole lot of effort to get people to do what they have no interest in. Do I believe they SHOULD have more interest? Yup, but that’s my perspective, not theirs. Preferences-based research is always a slippery slope — preferences change for some people with each new day. However, when we find what people prefer, we also connect with what motivates them. My hope is not that we will force people to move from where they are to a completely different place, but to expand their orientation to embrace greater balance — both as individuals as well as in Christian community. Is there indication of which moves are more comfortable or natural for people? I assume – maybe wrong – that expanding vertical or horizontal is easier than diagonal. So an inward/church person might be more readily motivated to move toward inward/God or outward/church, but not likely to go outward/God as a first expansion of preferences. In some ways this explains why younger members are skipping Church and going out into the community to serve in nonprofits.It is certainly why I focused on education issues for years. We have not been able to move the UMC culture for many decades. Maybe we should just give up on this in the local church and instead do what the Baptists do and use the congregations to support the ‘mission’ of local lay who serve outside of 4 walls opportunities that are not based in congregations. I keep coming back to the overall consultant studies of the General Conference ministries that they are ineffective, conflicting, silos that compete. How much more could we do if GC simply evaporated all of the core ministries and we put the capital to that small group of members who do want to go out into the world and minister. How much more effective would we be? Would ‘Nothing But Nets’ be our signature ministry? How many more people would we serve and minister to without the weight of Executive Bishops and their professional staffs, benefits, pension etc? The point is DS’s rarely rise to this level of leadership and Bishops never do. Maybe our DS’s and Bishops should be our best preachers and charismatic leaders in lieu of good ‘managers’. That is really what comes to top of mind.